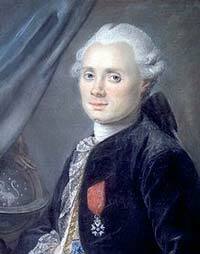 Charles Messier came to be known across the scientific community of Europe as “The Ferret of Comets.” That is because as a French astronomer, he discovered at least 20 comets, a remarkable feat considering that most famous astronomers of the day were lucky to find just one. Messier was eager to discover as many comets as he could, partially because they were of scientific interest, but he also hoped they would provide him with fame and notoriety. Comets are generally named after their discoverers, as in the most famous case, Halley’s Comet, named for English astronomer Edmund Halley. With only a basic education in reading, writing, and arithmetic, the young Charles Messier was a youth without parents and without prospects. But 1744 was the year of the appearance of a spectacular comet of six tails, easily visible to the naked eye across the Northern Hemisphere. At the time, Messier was only 14 years old and the comet filled him with a sense of wonder. Thus, as a penniless youth, Charles made his way on foot to Paris where he presented himself to a Parisian astronomer by the name of Delambres. He was hired as a lowly assistant to keep observatory records. Because of his excellent spelling skills and his “neat handwriting,” he was able to get his foot in the door. The job with Delambres led to another position with another astronomer. He learned the science of observational astronomy “on the job,” and his long career as an astronomer had begun. Messier’s subsequent obsession with discovering new comets led him to compile a list of astronomical objects which remains one of the most significant documents in the field today. The 110 objects listed in the “Messier Catalog” have been a useful tool and an icon of astronomy for almost three centuries. The Messier Objects are what appear to be fuzzy splotches of light in the deep night sky as seen through the most powerful telescopes of the day. These objects are actually star clusters, distant galaxies (such as the Andromeda Galaxy), and nebulae, or clouds of interstellar gas. What motivated Messier to make a catalog of these objects is the fact that they could easily be mistaken for comets that were still a far distance from earth. Messier was tired of getting the “false alarm” of believing he had spotted a new comet whenever his telescope swept across the night sky and spotted a distant galaxy, cluster, or nebula. Creating a catalog of where these objects were located saved astronomers a great deal of time. Over the years, amateur astronomers have considered it a point of honor to spot as many or all of the Messier Objects with their backyard telescopes. In fact, many astronomy enthusiasts still do this today. Messier was perhaps not a superior theoretician or mathematician, but his observational work earned him enormous respect and a place in astronomical history. A crater on the moon and an asteroid are named in honor of him. In his lifetime, Charles Messier was elected to three of most prestigious scientific organizations in Europe: The British Royal Society, the Royal Swedish Academy of Sciences, and the French Academy of Sciences. He died at the age of 86 in 1817.